"In addition to being of interest from a historical perspective, this finding gives us insight into the molecular basis of an economically important trait," said senior author John Burke, professor of plant biology in the UGA Franklin College of Arts and Sciences. "You often see ornamental varieties similar to the ones van Gogh painted growing in people's gardens or used for cut flowers, and there is a major market for them." To understand the genetic basis of this difference, Burke and his colleagues began by using the same plant crossing techniques that Gregor Mendel, a 19th century contemporary of van Gogh, used to lay the foundation of modern genetics. The scientists crossed the common, or wild type, variety of sunflower with the double-flowered variety, and their initial findings suggested that a single, dominant gene was responsible for creating the double-flowered mutation. Subsequent crosses of the offspring revealed that a second mutation, which is recessive to both the double-flowered mutation and the wild-type version of the gene, results in a third flower type that is intermediate in form, being elongated and yellow, but tubular and containing the reproductive structures of the interior florets. The scientists identified the responsible gene and sequenced it to show that in the double-flowered mutation, the portion of the gene that functions as an on/off switch is disrupted so that the instructions for making the outer rays are turned on in the portions of the plant that would normally produce the internal disc florets. In the second mutation, which results in the tubular florets, the insertion of a "jumping gene" disrupts the ability of the plant to produce normal ray florets. As a result, tubular florets are produced in place of the normal ray florets. Finally, the scientists screened hundreds of sunflower varietieswild type, double-flowered and tubularand found that wild-type sunflower varieties never have a mutation in the HaCYC2c gene, while the double-flowered varieties always have the same mutation in the on/off switch. In addition, the tubular varieties always have a disrupted copy of the gene. 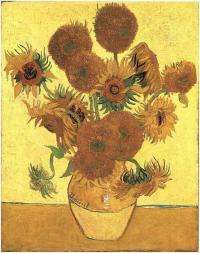 "All of this evidence tells us that the mutation we've identified is the same one that van Gogh captured in the 1800s," Burke said. It is interesting how we can get completely unexpected insights from the paintings. Reminds me of another paper relating Polock's works with fractals.